In 1993, we installed 40 circular, 10 m radius biometric plots in the footprint of the EMS tower on Prospect Hill. We randomly placed the plots within 100 m increments along ten 500 m transects that extend from the tower in the northwest and southwest directions. In 2001, we removed three plots (G3, H3, H4) from the datasets and ceased measurements there due to their inundation by a beaver pond. In 1999, we installed 6 additional circular, 10 m radius biometric plots on the Simes Lot, adjacent to Prospect Hill to study the effects of a selective harvest that occurred there in the winter of 2000-01. In the summer of 2001, we expanded the harvested plots in size to 15 m radius and ceased measurements at one plot (X4) because it was unaffected by the harvest. The harvest also affected three of the original tower plots (A4, A5, B5), which were expanded in size as a part of the harvest plot group. Consequently, there are 34 tower plots and 8 harvest plots. We have taken the following ecological measurements at each site: tree growth, woody debris, litter, leaf area increment (LAI), leaf chemistry, and soil respiration and moisture. Leaf area index (LAI) data was collected at the biometric plots of the EMS site in 1998, 1999, and every year starting in 2005. An LAI2000 sensor was used to make 5 measurements at each plot: one at the center, and four more at points 2 meters away from the center, in the 4 cardinal directions (N,E,S,W). All measurements were made near sunrise or sunset for diffuse light conditions. Plot-based LAI values were calculated using the standard methods of the LiCor program C2000. LAI values were calculated by averaging the 5 subplot values for each plot, and by masking the outer ring of the sensor (ring 5) so as to block out possible sunspots which may have hit the outer ring as the sun rose up from the horizon. In 2015 a new LiCOR LAI2200 sensor was purchased to replace the previous model, but comparisons between the two sensors showed consistent agreement. Measurements are currently taken bi-weekly in spring and fall to capture the changing LAI conditions during leaf-out and senesce respectively. During mid-summer, measurements are taken on a monthly basis, since LAI is relatively stable. Foliar chemistry data was collected from green canopy leaf samples in summers of 1998-2000, and 2006-2017 annually at the Harvard Forest EMS biometric plots. Green leaf samples were collected by shooting them down from the canopy with a shotgun. Samples were dried at 65 degrees C for 3 days, ground to a fine powder using a ball mill, and analyzed at the Harvard Forest on a Fison Nitrogen Analyzer NA 1500 in for the 1998-2000 samples and on an Elementar Vario Micro CHNS analyzer in for the 2006-2014 samples. Most recent C and N analyses were performed by the Laboratory of Adrien Finzi at Boston University. Litter has been collected, dried, and weighed annually at all plots since 1998. A portion of the collected leaves, fruits and flowers, and wood pieces from 1998, 1999, and 2000 were analyzed for N and C content following the same methods above. Three baskets with a radial area of 0.13 m^2 were randomly placed in each plot at the EMS tower footprint and Harvested sites. Litter collection began at the EMS site (plots A-H, 1-5) in 1998 and the Harvested site (plots X 1-6) in 1999. Each year litter was collected throughout the fall and once the following spring, dried and weighed. Each spring's measurement is included in the previous year's dataset. 1998-1999: Leaf litter was sorted by tree species. The unknown category refers to leaf litter from unidentified species, including leaves that we too fragmented or decayed to be identified. EMS data from 1999 onward excludes the harvested plots (A4, A5, B5), and from 2000 onward, excludes plots lost to a swamp (G4, H3, H4). There was no spring collection in 1999. Rather, the first collection of that year was in mid-August. We estimated that 30% of the total litter collected on doy.229, 1999 fell over the winter and was thus summed as part of the 1998 data and 70% of the total litter collected on doy.229 fell during the summer and was thus included in 1999 annual sum. 2000-2003: Litter was sorted by leaf species, fruits, flowers, buds, and twigs and barks. Measurements in the Harvested plot, X4, were discontinued after 2001 because it was unaffected by the harvest. 2004: Litter was sorted by leaves (including needles), and non-leaves (including twigs, bark, fruits, flowers, buds, etc.). 2005: Litter was sorted by leaves (including needles), twigs and bark, acorns, and (non-acorn) fruits, flowers, and buds. 2006: Litter was sorted by leaf species, fruits, flowers, and buds, and twigs and barks. "Decomposed matter" was included in the "unknown" category when litter mass was calculated. In the summer of 2006, baskets were repaired and mesh was replaced with that of a finer gauge where necessary. The random placement of the baskets in plot G4 was redone because they appeared to have been non-randomly moved to the driest portion of the plot to avoid flooding from adjacent beaver pond. 2008: Litter was sorted by leaf species, fruits, flowers, buds, twigs and barks and conifer cones. Decomposed matter was sorted as a component of the "unknown" category and all oak species were included in the same category. Because of the December 2008 Ice Storm there was a large pulse of woody material to the forest floor that would not have usually fallen. Therefore all of the woody material was removed from day.498 for comparison to other years. 2009: Litter was sorted by leaf species, fruits, flowers, buds, twigs and barks and conifer cones. Decomposed matter was sorted as a component of the "unknown" category and all oak species were included in the same category. 2010: Litter was sorted by leaf species, fruits, flowers, buds, twigs and barks and conifer cones. Decomposed matter was sorted as a component of the "unknown" category and all oak species were included in the same category. There was no litter data from 2010 in plot G4, presumably because the site was waterlogged. 2012: Some of the samples collected on 9/21/12 were not dried completely when stored. As a result many of the paper bags ripped and spilled litter into the garbage bag holding them all. In January 2013 when this problem was noticed some of the samples were moist and partly decomposed, but there was not much visible fungus. The samples from this collection date were all re-dried and re-bagged. The moist samples were from plots: A1, B1, C1, D1, E1, E2, E3, E4, E5, F1, F2, F3, F4, F5, G1, G2, G4, G5, H1, H2, and H5. The spilled litter at the bottom of the large plastic bag was combined into a new paper bag and labeled as "mixed plots" since it was not entirely clear which plots the litter came from. Additionally four of the sample bags had been ripped such that the original labels on them could not be read, and thus we can't be sure which plots those litter samples came from. By process of elimination, those unreadable sites were: A1, C1, G2, and G4. Based on the contents of the bags, we can make assign the most likely plot identity based on the plots’ previous species composition in September collection dates. C1 is mostly composed of oak. G2 has a lot of hemlock. G4 contains fern leaves. Therefore the last remaining bag is most likely A1.These samples were relabeled according to this logic, and are referred to as “partial” plots. The other samples collected on this day were kept in a different garbage bag and seemed dry, but were re-dried nonetheless. The weights from the "mixed plots" litter was systematically re-assigned into the “partial” plots where that species was found historically. The actual weight reassigned to a given plot was proportional to is contribution to the total species weight in partial plots over the previous three years’ September collections. Small amounts (less than 0.1 g) of spruce and red pine needles in mixed litter that were not historically present in the partial plots were excluded from the corrected data set because of uncertain origin. Missing replicates: At some points in the litter collection, plots and baskets were missed: doy.229 1999: plots B1, C2, and E1 contained birds' nests that had been built in the traps, which thus contained materials that had not fallen directly from the canopy into the baskets. doy.229 and 531 1999: Out of all the Bradys, only the plots A4, A5, and B5 were visited. From doy.299, 2001 through 2005, X1 only had two baskets. On doy.250 2001 there was one less basket in the EMS site. In 2003 H1 only had two baskets. From 2004-05 B2 only had two baskets. 4/23/07: X1 had 1 basket, A5 had 2 baskets, C2 had 2 baskets, all b/c some baskets had been blown over. 2010 - G4 wasn't sampled this year. In 2012, the following baskets and dates only had 2 baskets: B3 on 10/23/12 and 11/20/12; D1 on 10/23/12, 11/20/12, and 04/30/13; and H5 on 11/20/12. All of these exceptions were taken into account when calculating annual sums. Site level calculations of productivity: Plots A4, A5, B5, G3, H3, H4 are excluded from all calculations for the EMS site, and the plot X4 is excluded from all calculations for the Harvested site, although they remain in the raw data for years when measurements were taken there. During the first week of December, 2001, mesh bags (w/ a 1 square mm mesh size) containing oak, maple, and beech leaves were set out on the ground in five plots. The litter samples were oven dried, but then sat on a shelf before they were weighed again and put out for this particular study. Therefore, any moisture the leaf samples may have accumulated between when they were oven dried and when they were weighed is accounted for in the processing. Samples were collected on several dates over the following years. Eventually, the bags accumulated too much dirt and roots growing through them that the leaves could not be separated for weighing. This was the case for the samples that have no end weight recorded. Two samples, B5 24 and B3 74, gained weight over the time period that they were outside, which means there was either a mistake in collecting or recording the data, or the mesh bags actually gained material while they were outside that was not part of the original sample. These samples were removed from the data in the processing. Two TDR probes were located at each plot where soil respiration was measured. Many more measurements were made at the cut-site plots than the EMS plots in the early years because the primary goal at that time was to track a potential change in soil moisture due to the selective harvest that occurred in 2001. Two different instruments were used to generate the TDR waveforms. For 1999-2001 a Tektronix cable tester (1502B TDR) was used and in 2002-03 a soil moisture system by Campbell Scientific (TDR100 and CS605 probes) was used. Soil respiration was measured throughout the growing season in 1998-2000, 2002-2003, and once in 2006. It was measured in 9 plots in EMS tower footprint (B3, B4, C3, D5, E3, G3, H3, H4, G5) and in 9 plots on the adjacent harvest site (A4, A5, B5, X1-X6). See the plot map for plot locations. There are 5 permanently installed soil collars in each plot. Each collar has a unique number, 1-90. 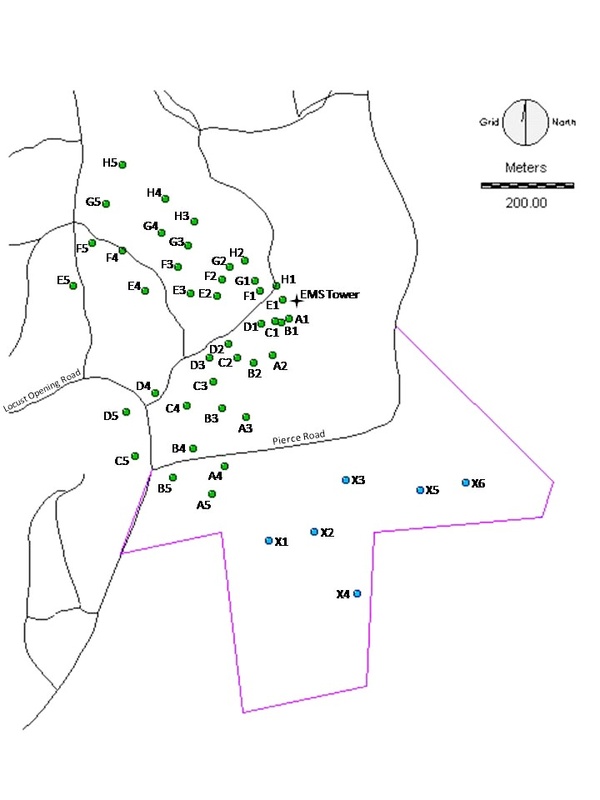 Plots for measuring soil respiration in the EMS tower footprint were chosen to be distributed across a range of soil drainage classes - 3 poorly-drained sites, 3 moderately drained sites, and 3 well-drained sites. The 3 poorly drained plots (G3, H3, H4) were inundated with water from a beaver pond and measurements ceased there in 2001. Measurements at the cut site began in 1999 and a selective harvest occurred on the site in 2001. Measurements at plot X4 ceased in 2001 because the plot was unaffected by the harvest. Respiration was measured using a portable soil pack with a LICOR 6252 in a closed chamber system. CO2 was recorded every 5 seconds for between 3.5 and 4.5 min. In 1998, some of the measurements were made at night, after 6pm. Soil CO2 flux was calculated assuming a cylindrical chamber, negligible volume in the sample flow lines and LiCOR cells, and a constant air pressure. Chamber height was taken as the sum of the chamber top (11.3 cm) and the average height of individual collars, as measured in the field. Soil and air temperatures were measured in the field at the time of each soil respiration measurement. Air temperature data was filled with half hourly air temperature data measured at a height of 2.5 m on the EMS tower. To estimate the slope of the CO2 vs. t curve, we first smoothed the curve with a Savitsky-Golay filter, and then took the mean and standard deviation of the first derivative where it flattened out at the back side of the curve. The portion of the first derivative that was used in the calculation was selected by hand for each individual curve. If the first derivative never flattened out, a soil flux was not calculated. Soil fluxes were also not calculated for curves where the relative standard deviation of the first derivative was greater than 1. The mean and standard deviation of the first derivative of each curve, along with the number of points used to calculate them, are printed with the flux data, giving the user of the data the option of filtering the data with more or less rigourous standards. All live trees greater than or equal to 10 cm DBH were measured in the tower plots and greater than or equal to 5 cm DBH in the harvested plots. Each tree's DBH (cm) was calculated from measurements of their dendrometer's expansion (or contraction) (mm), which were taken with digital calipers. To minimize discontinuity in any tree’s DBH when dendrometer bands are replaced, or new reference DBH tape measurements were taken, we now calculate DBH by applying each reference DBH tape to the entire dendrometer record, and then taking the median value. Species specific allometric equations were used to calculate each tree's weight (kg) from their DBH (not including leaves). Each tree's carbon content was assumed to be one half of its weight. The trees' weights in C were summed at the site level to yield aboveground woody biomass (AGWB) and growth increment (AGWI), and biomass lost to mortality and gained through recruitment, all in MgC/ha/yr, for each year and site. We define AGWI as the sum of the difference in current year maximum AGWB and previous year maximum AGWB, not including new recruits or deceased trees. Net primary production (ANPP) was calculated as AGWI + the sum of the increment of ingrowth + the sum of fine litter fall using the methods described in Clark et al. 2001. Ingrowth is defined as the difference in AGWB of new recruits and the Biomass of a conspecific tree with the threshold DBH of 10 cm. Note that measurements for years 1994-1998 at the tower site represent multi-year averages. The understory data includes saplings and shrubs greater than or equal to 1 cm DBH and less than 10 cm DBH at the tower plots and less than 5 cm DBH at the harvested plots. Saplings and shrubs were measured in the tower plots in November 2004 and 2006 and in the harvested plots in early June and November 2006. Diameters were measured with digital calipers and recorded in centimeters. For the 2004 survey, trees were measured in 1 cm increments (ie. greater than or equal to 1 to less than 2, greater than or equal to 2 to less than 3, etc.) and the number of trees in each plot, species, and size group were tallied in the column labelled "nindivs". For the 2006 surveys all stem measurements were listed individually. Note that yellow and black birch trees are difficult to tell apart when they are small and should be considered interchangeable in the understory data. Coarse woody debris (CWD) is all pieces greater than or equal to 7.5 cm diameter. CWD surveys involved measuring all fallen logs, stumps, standing snags, and whole dead trees in our biometeric plots in the footprint of the EMS tower and at our cut site on the Simes Trust land. In 2016 and 2017, methods were transitioned to the line transect method from Harmon and Sexton 1996, which gives the following formula for calculating volume per unit area (m^3*m^-2): V=9.869 * sum(d^2/8*L), where d is he piece diameter in m and L is the total transect length in m. Each EMS plot had three 10 m transects from plot center to perimeter at 0, 120, and 240 degrees declination. Harvest plot transects were 15m long to match its plot size. Fine woody debris (FWD) was also measured using the line intercept method. However for FWD, line transects were randomly placed in different locations across the tract of land for each survey and every other 10 m segment on the transect was surveyed for FWD. FWD is all pieces greater than or equal to 2 cm in diameter and less than 7.5 cm in diameter. Annual means and 95% confidence intervals (where plots and segments are the unit of measurement) of volume and biomass are summarized in the files labeled "summary". Biomass was calculated from volumes using decay-class specific densities from Liu et al 2006. For CWD pieces categorized as whole tree snags, biomass was calculated using species-specific allometric equations for live trees, which are listed for our live tree data. Volumes of whole tree snags were calculated from biomass estimates using the inverse of Liu et al's densities. Harmon ME and Sexton J. 1996. Guidelines for measurements of woody detritus in forest ecosystems. Publication No. 20. U.S. LTER Network Office: University of Washington, Seattle, WA, USA. 73 pp. Liu WH, Bryant DM, Hutyra LR, Saleska SR, Hammond-Pyle E, Curran D, Wofsy SC. 2006. Woody debris contribution to the carbon budget of selectively logged and maturing mid-latitude forest. Oecologia 108(1): 108-117. Munger W, Wofsy S. 2018. Biomass Inventories at Harvard Forest EMS Tower since 1993. Harvard Forest Data Archive: HF069. species: species. Leaf samples were collected by shooting them down from the canopy with buckshot. See the allometries file for a key of species abbreviations. species: species. See the allometries file for a key of species abbreviations. spp: species. See the allometries file for a key of species abbreviations. species: species.See the allometries file for a key of species abbreviations. plot: plot. Whereas the first four plots are located in the Simes Trust land, which was cut in the winter of 2000/2001, the control plot, B3, is located on Prospect Hill in the EMS tower footprint, just across the road from the cut site. The upland and lowland descriptions refer to the rocky topography of the plot and whether the bags were in a low or high spot. tag: number identifying the piece of CWD. Corresponds with aluminum tag in field. If tag could not be found in re-survey, "NA" was recorded. 6-digit numbers correspond to megaplot tags.